This article provides in-depth fundamental analysis of AksharChem (India) Ltd, an Indian manufacturer of dye intermediates (Vinyl Sulphone) and pigments (CPC Green and CPC Violet) based out of Gujarat. Growth should be a consistent year on year. Ignore companies where a sudden spurt of sales in one year is confounding the 10 years performance. AksharChem (India) Ltd is growing at a decent sales growth of 20.46% over last 10 years with a very good net profit margin that justifies that co. has good financial strength. AksharChem (India) Ltd has an excellent profit growth of 128 over last 10 years. From the year 2014, Aksharchem Ltd is regularly paying out tax with more than 30% that glimpse about last three years. AksharChem (India) Ltd has a good interest coverage 9 times in recent years that also means that company has sufficient interest coverage to paying out its interest. AksharChem (India) Ltd has current liquid assets more than the liabilities to take care of its current liabilities. That suggests AksharChem (India) Ltd’s strong position. NPM is 4-9% since last 4 years, it is improved in the current year due to high-profit margin after china ban related product due to environment factors. Debtors days improving from 63- 44 (2007-2016). Net fixed assets turnover (NFAT) ratio is increasing since 2008- 2016 from 4.5-7.0 and decrease to 3.3 in 2016 due high fix asset in 2015 and 2016. Debt is increased from 8 to 31 in 2007-2016 but Debt to equity is 0.19 and it’s almost debt free as per the current fix and liquid assets. The P/E ratio is 10.03 which give somewhat margin of safety at the current price. (P/S ratio) is 2.11 but high-profit margin, as well as current approved CAPEX of 175 cr over 12-18 month, give better sales in coming quarters. We can see below that AksharChem (India) Ltd is growing at higher sales and profit growth rate than other peer companies. The increase in production capacity and sales volume: 2009 (6292 MT) – 2016 (9240MT): – currently board have approved the CAPEX of 175cr for coming 12-18 months for capacity and product portfolio expansion. Salary: salary of promoters in 2015-16 is approx. 75 L against net profit of 16cr which is 4.69% of net profit, higher than the average of 2% of net profit. Promoter buying the shares: shareholding of promoters has changed from 60 -70 % over 2011-1016. By issue of equity share promoters may have increased the shareholding from 60-72%, please clarify. I don’t understand the impact of this on minor shareholders. one business segment) or related products. We can see that the self-sustainable growth rate (SSGR) of AksharChem (India) Ltd is about 11-35% over last two years. However, AksharChem (India) Ltd has been growing at about 21% over last 10 years. Comparison of past sales growth with SSGR would indicate that it could fund its entire growth by its profits. FCF is one of the key parameters to determine the margin of safety present in the business of any company. After meeting its entire capex it has free cash flow which shows margin of safety. The revision in the ratings assigned to the bank facilities of AksharChem (India) Ltd takes into account the significant improvement in its operating profit during H1FY17 on back of increase in sales realizations of its key product, Vinyl Sulphone (VS), due to global short supply and resultant improvement in its leverage and liquidity indicators marked by AIL’s zero net debt position with unencumbered liquid investments exceeding its total debt as on Sept. 30, 2016. Currently, ban of competitor chemical product from china and approved CAPEX will give high-profit margin and sales growth. AksharChem (India) Ltd seems to be a company growing at a decent pace of 20%, which has been witnessing steady improvement in the profitability margins due to improvement in the sales mix by focusing more on the high profitability. AksharChem (India) Ltd has been able to significantly improve its working capital management over the years, which has led it to keep its debt levels under check despite doing significant capex to support the sales growth. please focus on some doubts. Promoters’ shareholding increase by the issue of more shares, the salary of promoters is approx. 4.69%. High CAPEX approved by the board of directors about 175 cr over next 12-18 Months and its financial impact on business. We appreciate the hard work you have put to prepare this report on AksharChem (India) Ltd. The report is useful for any investor who wishes to analyse AksharChem (India) Ltd. I thank you on behalf of all the readers of www.drvijaymalik.com for the time & effort put by you. An investor needs to keep an important event in the life of AksharChem (India) Ltd while analysing the company for investment. The event relates to the rearrangement of business assets between the group companies: AksharChem (India) Ltd and Asahi Songwon Colours Ltd in FY2015. 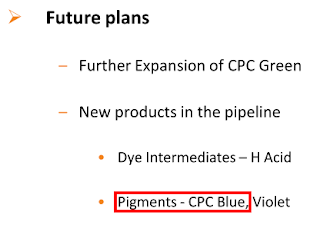 Before FY2015, the business of the two companies constituted primarily Vinyl Sulphone in AksharChem (India) Ltd and CPC Blue and CPC Green pigments in Asahi Songwon Colours Ltd. However, in FY2015, the promoter family rearranged the business in a manner that the CPC Green business division of Asahi Songwon Colours Ltd was shifted to AksharChem (India) Ltd.
As a result, from FY2015 onwards, AksharChem (India) Ltd contains Vinyl Sulphone and CPC Green pigment divisions and Asahi Songwon Colours Ltd contains CPC Blue pigment divisions. We will discuss more about the business rearrangement among the promoter family later in the article, however, it is of importance currently that the financial performance of AksharChem (India) Ltd before and after FY2015 might not be comparable on a sequential basis. This is because of up to FY2014, the financial numbers represent the performance of Vinyl Sulphone alone and from FY2015 onwards, a mix of Vinyl Sulphone and CPC Green pigment. Moreover, it also presents a good opportunity for the investor to understand the business dynamics of Vinyl Sulphone business division as the financial numbers up to FY2014 are exclusive to Vinyl Sulphone. Until FY2014, AksharChem (India) Ltd has been growing at an average rate of about 20% per annum, however, the growth was interrupted by a period of sudden decline in sales as well as very poor profitability. In fact, AksharChem (India) Ltd hardly made any profits until FY2012. It was making operating losses almost every alternate year. Primarily it is from FY2015 onwards that the company seems to have seen stabilization in its profitability margin. Based on the above observation, an investor would notice that Vinyl Sulphone previous to FY2012 has been a very gruesome business, which despite year-round efforts of the management was resulting in losses. The above section clearly states that in the past Chinese players enjoyed cost advantages on account of lower costs related to following environmental friendly production processes and it was very difficult for Vinyl Sulphone players to make any profit. As a result, AksharChem (India) Ltd has been able to witness very high operating margins since last few quarters on its Vinyl Sulphone segment resulting in overall high margins for the company. It is the major reason for the sudden increase in profitability margins of the company. An investor would appreciate that the major risk to such profitability of the company would the resurgence of Chinese manufacturing in future, which might again tilt the scale against AksharChem (India) Ltd. However, we believe that instead of taking the management’s view on the face value, an investor should notice that the primary factor leading to previous advantages of the Chinese players and their current disadvantages is the stance of the Chinese government. An investor should be aware that political dispensations in the countries, as well as their policy stances towards industries, keep on changing continuously. If the future leader of the state in China changes the approach of current government, then the industry situation might go back to the previously prevailing scenario and the supposedly high operating margins of Vinyl Sulphone division might again end up becoming operating losses. Therefore, we suggest that the investors avoid believing the management without doing their own homework and always take the calculated risk while making investment decisions where the success is dependent upon the changing stance of governments. As the operating margins of the company have witnessed a marked improvement in the recent quarters, the management is of the view that it would be able to maintain operating profit margins in the range of 27-30% going ahead. To assess the feasibility of such margins, an investor needs to assess the profitability margins of each of the business segments of AksharChem (India) Ltd: Vinyl Sulphone and CPC Green pigments. We have analysed above that the profitability margins in the Vinyl Sulphone business seem only due to the changed stance of Chinese Govt towards its chemical industry. Otherwise, the Vinyl Sulphone business would hardly make any profits, as has been the case in the past. To assess the sustainable margins of the pigment business, an investor should analyse past performance of Asahi Songwon Colours Ltd, which has been a pure play in the pigments segment. The past performance of Asahi Songwon Colours Ltd indicates that the OPM though cyclical in nature over the years has been around 15-16%. The same OPM levels might be expected to continue ahead for the pigments division of AksharChem (India) Ltd, which forms about 40% of the sales of the company. To achieve and sustain the operating profitability margins of 25-30% as communicated by the management, AksharChem (India) Ltd needs to earn OPM of 30% on Vinyl Sulphone (60% of sales of company) to achieve OPM of 25% for entire company and needs to earn an OPM of 40% on Vinyl Sulphone to achieve OPM of 30% for entire company. An investor would recall that the profitability margins of Vinyl Sulphone division had been dismal and erratic in the past bordering on losses and its profitability margins have improved recently only due to the interference of Chinese Govt. Therefore, the profitability margins expected by the management going ahead would depend a lot upon the actions/non-actions of Chinese Govt on its policies towards chemical industry going ahead. As a result, even though the management seems confident that they would be able to command better margins for next 10 years, we advise that investors should take it with a pinch of salt and keep monitoring the profitability margins closely going ahead. As far as the visibility of future growth is concerned, the management has mentioned in the February 2017 conference call that AksharChem (India) Ltd is currently using about 73% of the installed capacity of Vinyl Sulphone and about 98% of the installed capacity of pigment division. To continue supporting the sales growth further, AksharChem (India) Ltd plans to expand its manufacturing capacity further by taking a capital expenditure of ₹175 cr, which should provide the ability to increase revenue going ahead. An investor would appreciate that the manufacturing processes of chemical industry have a lot of impact on the environment, therefore, obtaining environmental clearance for the planned capacity becomes crucial for any company. As mentioned by the management in the results presentation of February 2017, it takes about 3 years to get environmental clearance. Moreover, as per the credit rating report for AksharChem (India) Ltd released by CARE Ltd, the company is in an advantageous position as it already has got environmental approval for its future planned capacity. The tax payout ratio of AksharChem (India) Ltd has been fluctuating in the past until FY2013, till the time it had been reporting dismal financial performance with intermittent losses. However, since FY2014 onwards, the company has been reporting tax payout ratio at the levels of standard corporate tax rate prevailing in India. While assessing the operating efficiency parameters as well, we need to keep ourselves aware of the addition of CPC Green pigment in its business a few years back as the Vinyl Sulphone and CPC Green pigment have different manufacturing characteristics and they need to be assessed in this light. 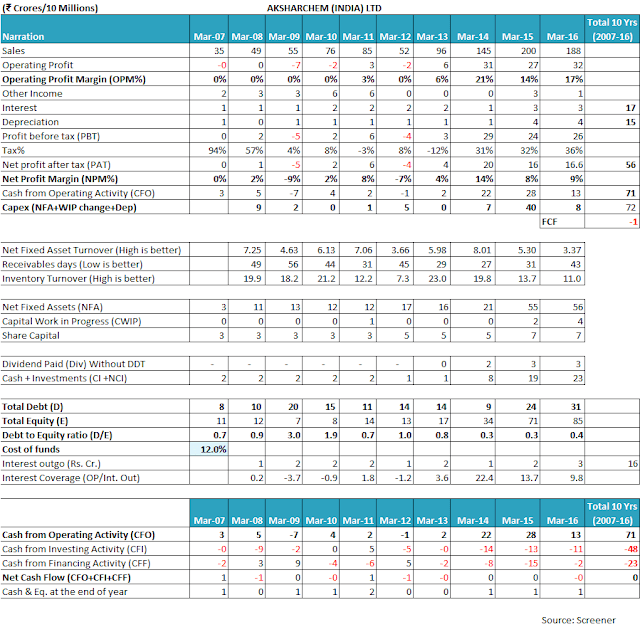 The investor may analyse the asset utilization parameters of AksharChem (India) Ltd until FY2014 to understand the characteristics of Vinyl Sulphone business and the asset utilization levels of Asahi Songwon Colors Ltd (in the screenshot shared above) to understand the characteristics of Pigment business. An investor would notice that the net fixed asset turnover (NFAT) of AksharChem (India) Ltd has been averaging about 5-6 until FY2014, whereas the NFAT of Asahi Songwon Colors Ltd has been around 2-3 over the years. It indicates that the Vinyl Sulphone business has been less capital intensive than the pigment business. As a result, it is expected that going ahead, the capital intensiveness of AksharChem (India) Ltd would increase. It seems to be the reason that the NFAT of the company has witnessed a decline in last 2 years since when the CPC Green pigment division has been merged with it. The management has also accepted it in the conference call in February 2017 and stated that going ahead, the company might witness an NFAT of about 2, which would entail much more capital expenditure to fund future growth than what it has been incurring in the past. When an investor analyses the inventory turnover ratio (ITR) of AksharChem (India) Ltd, then she would observe the similar factors that the ITR of Vinyl Sulphone division has been very high 18-20 in the past (ITR of AksharChem (India) Ltd until FY2014), whereas the ITR of pigment division has been comparatively lower at levels of 8-9 (ITR of Asahi Songwon Colors Ltd). Therefore, upon merger, the ITR of AksharChem (India) Ltd has witnessed decline to 11 in FY2016. Going ahead as well, the ITR of AksharChem (India) Ltd is expected to remain lower than what it used to achieve until FY2014 and become more working capital intensive than the past. The same observations stand out when the investor analyses the receivables days of the two different business divisions of AksharChem (India) Ltd. The customers of Vinyl Sulphone used to pay AksharChem (India) Ltd in about 45-50 days in the past, which it has brought down to 27 days in FY2014. However, the customers of the pigment division seem to clear payments in 70-85 days (receivables days of Asahi Songwon Colors Ltd). As a result of merging of Vinyl Sulphone and pigment division, we notice that the receivables days of AksharChem (India) Ltd have increased from 27 days in FY2014 to 43 days in FY2016 leading to more money getting stuck in the receivables. Therefore, the assessment of all the operating efficiency parameters: NFAT, ITR and receivables days indicate that going ahead, the business of AksharChem (India) Ltd is expected to witness higher capital intensiveness as well as higher working capital requirements, which would put a stress on the funds requirement and liquidity position of the company going ahead. The analysis of free cash flow generation indicates that AksharChem (India) Ltd has been barely able to meet its capital expenditure requirements through internal accruals. The acquisition of CPC Green pigment division was funded by equity dilution as new shares of AksharChem (India) Ltd were given to shareholders of Asahi Songwon Colors Ltd in FY2015 in lieu of the demerger of CPC Green division from it. The payment of this consideration in cash would have stretched the balance sheet of AksharChem (India) Ltd. In light of the same, it becomes essential that the company maintains the recent trend of improved profitability and moreover also convert the profits into cash. If the assumptions by the management of sustained pricing power to Indian chemical suppliers for next multiple years does not prove good, then we might see the company failing to meet the above described increased funds requirement from internal accrual. This, in turn, might put a stress on the balance sheet strength going ahead. Therefore, it is essential for the investors to continuously monitor the profitability and working capital management efficiency of the company going ahead. Investors should be cautious of investing in companies, which might have to fund their expansion plans by raising debt and more so when the companies might not maintain high profitability margins. This is because, in such situations, high debt has the potential of increasing the risk and further reduced profitability under tough business conditions. The rearrangement of the business divisions between AksharChem and Asahi seems a way of assets allocation by the mother Ms Paru M. Jaykrishna among her two sons: Mr. Munjal M. Jaykrishna and Mr. Gokul M. Jaykrishna. Prior to rearrangement, AksharChem had a smaller business of Vinyl Sulphone and Asahi had a larger business of CPC Blue and CPC Green pigments. As a result of the rearrangement effective from FY2015, AksharChem is now vested with Vinyl Sulphone and CPC Green pigment businesses and Asahi is left with CPC Blue business, which seems more or less comparable now. Things look good until this point as it seems that the independent business interests have been handed over to each of the brothers by Ms. Paru Jaykrishna and the brother seems to be keen to grow their businesses. This is evident from the recent expansions done by AksharChem (India) Ltd in its capacity of CPC Green and addition of new pigment CPC Violet. The investor would appreciate that CPC Blue is the key business remaining in Asahi Songwon Colors Ltd. 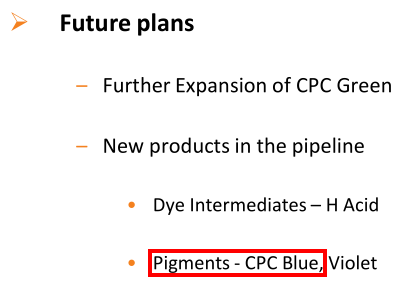 Therefore, it remains to be seen whether the start of manufacturing of CPC Blue pigment by AksharChem (India) Ltd would pose a competitive threat to Asahi Songwon Colors Ltd and thereby pose the probability of start of business/sibling rivalry among the family or it is a business collaborative decision where the family is still tightly knit. Therefore, we believe that the investors should be cautious and keep a close watch on the developments related to the management actions of both the companies AksharChem and Asahi to understand whether the brother is moving in confrontational position. This is essential because there have been evidence in the past where the minority shareholders have lost while the majority shareholders/promoters have been busy settling their personal business rivalries using public companies as their means. The list even contains minuscule investments of a few thousand rupees in some of the companies, which questions the seriousness of these investment decisions as being significant value adding to the shareholders of AksharChem (India) Ltd. Eight companies out of the total list of more than 30 companies have investments less than ₹1 lac. Various companies have undergone name changes e.g. Raymond Synthetic Ltd to Recron Synthetics Ltd, Ipitata Sponge Iron Ltd to Tata Sponge Iron Ltd etc. However, the new names of these companies are yet to be updated in the annual report of AksharChem (India) Ltd. It makes the independent assessment of the current worth of the said quoted investments a bit challenging. It would have been better that the company would either use these funds in the company operations, to do capital expenditure or distribute it to shareholders. Upon analysis of AksharChem (India) Ltd, an investor would notice that the company in recent past has bought and sold subsidiary companies in quick succession. It pertains to its investments in Akshar Pigments Private Ltd and Chhatral Environment System Private Ltd. In the case of both these companies, the management has mentioned that these companies were yet to start operations and therefore, it has sold its stake in these companies. However, there does not seem to be any change in the status of these companies since the time AksharChem (India) Ltd invested in these companies some time back. Therefore, it might be the case that the management might not have put enough thought while making these investment decisions and might have acted in an impulsive manner both at the time of initial investment and then divestment a short time later. One of the reasons leading to the recovery of excess remuneration might be that AksharChem (India) Ltd might have failed to get the central govt. approval for payment of remuneration to management, which is higher than the statutory limits. Usually, while consolidating the accounts, a company is expected to merge its subsidiary companies (>50% shareholding) in itself and show the interest of the third parties in such subsidiary companies as minority interest. Usually, in such cases, the investment in the subsidiary company is not shown as a non-current investment as it forms part of the shareholder’s equity and reserves of the consolidated entity. We believe that an investor should spend more time analysing the basis/assumptions in the consolidation of accounts, which are followed by the company and if necessary, then take clarification from the company. We believe that while assessing the project execution skills of the management, investors should focus more on the organic greenfield/brownfield capacity addition. In the case of AksharChem (India) Ltd as well as the Jaykrishna group, it seems that the companies have been able to successfully execute the expansion projects in the past. The share price at the date of allotment was ₹25.55/-. The preferential issuance of equity shares to promoters is a better event for the company and minority shareholders than the preferential issuance of warrants to promoters. This is because, in the case of preferential issuance of equity shares, all the money is received from promoters upfront, which can be used by the company for its purposes. Whereas in case of warrants, only 25% is available to the company for usage and balance 75% is contingent on the promoter finding the warrants in the money at the time of exercise (meaning that the market price of shares is higher than the warrants’ price and promoters make a profit by converting warrants into shares). So the 75% is received only when promoter benefits by warrants conversion otherwise the company will have only 25% of the funds for its usage. It leads us to believe that warrants are only 25% beneficial to the company & minority shareholders and 75% beneficial to promoters. Until FY2011, AksharChem (India) Ltd was going through very tough business phase due to Chinese completion. It had hardly made any operating profit over last 5 years. In such a situation, companies find it difficult to raise funds from external sources like banks etc. The share price of AksharChem (India) Ltd since November 2010 to mid of May 2011 had been hovering around or below the allotment price of ₹18.50. However, whether the stock price in this duration, which saw very low volumes, was the actual market price or the promoters had deliberately kept it depressed so as to get the preferential allotment at a low price is something we are not able to comment on. An investor should make her own inference in this regard. AksharChem (India) Ltd is currently available at a P/E ratio of about 10 based on last 12 months EPS, which offers a margin of safety in the purchase price as described by Benjamin Graham in his book The Intelligent Investor. However, it remains to be seen, whether the company would be able to show any margin of safety in the business model by generating sustained free cash flow going ahead. Overall, AksharChem (India) Ltd seems to be a company which was undergoing through very difficult business situation until recently when it got a better performing CPC Green pigment division as part of the promoter family arrangement. The company has been lucky that the better profitability of CPC Green division has been supported by the surprising improved profitability of Vinyl Sulphone division due to change policies of Chinese govt. As a result, the credit rating of AksharChem (India) Ltd has witnessed good upgrades in recent time. However, the CPC Green division has brought in a business, which is more capex and working capital intensive when compared to existing Vinyl Sulphone business. As a result, going ahead, the growth of AksharChem (India) Ltd is expected to consume more funds than what it was doing in the past. The promoters seem to have settled for independent business responsibilities in the group with both the brother looking after separate businesses. However, the plans of AksharChem (India) Ltd to start production of CPC Blue pigment, which is the key product of Asahi Songwon Colors Ltd, is raising the probability of sibling rivalry being at play. An investor needs to be cautious in such a situation. The investment decisions of AksharChem (India) Ltd leaves a lot to be desired whether it is related to investing in subsidiaries or into quoted equity shares of other listed entities. It is desired that the company would improve its investing process so as to generate more value for the shareholders from its investments. Going ahead, we believe that investors should keep a close watch on the developments in the Chinese policies related to the chemical industry, consumption of capital by the company for its growth and the management decision with respect to new products and investments. These are our views about AksharChem (India) Ltd. However, you should do your own analysis before taking any investment related decision about AksharChem (India) Ltd.